John Henry Neumann: educator and churchman; born 5 March 1926, in Rosenwald in the Slavgorod settlement of western Siberia, to Heinrich Dietrich Neumann (1885-1955) and Sarah (Wiebe) Neumann (1890-1958). He was the eleventh in a family of sixteen children. On 31 July 1947, John married Mary Hooge. They had four daughters and one son. John died at 70 years of age on 25 January 1997, in Chilliwack, British Columbia. Before his first birthday, John H. Neumann moved with his family to Canada, settling in Gerald, Saskatchewan. In 1928 the Neumanns moved to Bredenbury, Saskatchewan, and in 1932 to Gem, Alberta. In 1945 the Neumann family moved to British Columbia. Then for two years John attended Bible school in Sardis at what is now the Greendale Mennonite Brethren Church. There he met Mary, who was a classmate. John spent the rest of his years in leadership and service, for the most part in the Chilliwack area. John's vocation as a farmer and sawmill employee altered when he broke his leg and his doctor advised a change of vocation. John and Mary moved to Vancouver in 1950, completing grades 12 and 13 at King Edward High School and then attending the University of British Columbia. Four years later they were back in Chilliwack, John at his first teaching assignment. In spite of a bout with rheumatic fever in his second year at UBC, he earned a BA in English and history as well as completing teacher training. Later he also earned Bachelor of Education and Master of Education degrees there. Thirty years of educational experience saw John as an outstanding high school teacher and principal, with his final half year as a Director of Instruction at the District #33 board office. During those years and on into retirement (1983), John was involved in professional service and leadership at both district and provincial levels. John was both respected and appreciated by his many colleagues. 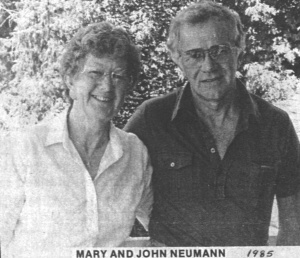 In succeeding years, John and Mary were both engaged in teaching English as a Second Language in China (1985-86, under China Education Exchange, an inter Mennonite agency to send north American teachers to China and to bring Chinese educators to North America as teachers and students) and in Lithuania in 1992, connected with Lithuania Christian College). The community beyond the school system also benefited from John's contributions. He served on the Chilliwack General Hospital Board of Trustees, in the Rotary Club, as a District Returning Officer, in Family YMCA fundraising, and in Man to Man prison ministry. With his leadership gifts, John was also active in the church. A member of the Mennonite Brethren Church since 1942, he served as secretary on the executive of BC and Canadian Conferences. At Broadway Mennonite Brethren Church he worked at various times with youth and Sunday school, in Christian education, as moderator, and on the board of elders. In the mid 1950s he was provincial youth leader. John served Mennonite Central Committee, BC, as chairman for five years, and was also on the executive of Mennonite Central Committee Canada. In spite of John H. Neumann's busy involvement, Mary, his wife, and their children did not feel they were being neglected. Mary fondly remembers John's sense of humor and occasional absent mindedness, his love for their children and grandchildren, and his tireless charm. He was a man of principle who loved God, the people around him, and the work he had chosen to do. Friesen, George. "Neumann, John Henry (1926-1997)." Global Anabaptist Mennonite Encyclopedia Online. April 2002. Web. 19 Apr 2019. http://gameo.org/index.php?title=Neumann,_John_Henry_(1926-1997)&oldid=76208. Friesen, George. (April 2002). Neumann, John Henry (1926-1997). Global Anabaptist Mennonite Encyclopedia Online. Retrieved 19 April 2019, from http://gameo.org/index.php?title=Neumann,_John_Henry_(1926-1997)&oldid=76208.